This entry was posted in For Dance Leaders on 17th November 2017 by ChrisG. Along with a photo, here are some comments about our 2017 Leaders Guild Retreat in Oxford. It was such a lovely weekend, deep, and heart-warming, and so encouraging to see the dedication and talent that are being shared in dance circles all over the country. Like last year, we all really appreciated the chance to meet as a circle of dance leaders, sharing support and inspiration, in deep mutual understanding of our shared journey. We would like to share some comments from many of the fifteen participants. We think they speak for themselves! – Thank you for many insightful sharings and practices. I feel inspired to move forward! – I feel grateful for the precious time and sharing with fellow beloveds on this blessed but also challenging path of Dance Leading. It felt very nurturing and enjoyable too. – I was so grateful for the meeting, and it has renewed my confidence in and enthusiasm for dance leading. – It was very rich to share this time together. Stirring and deepening. Good to be with the Sangha. renew old connections and make new ones. – What did that weekend do to me? At first it was hard to adjust back to normal life back at home, children arguing…. how do I deal with the sudden disappearance of all these beloved people? Then something happens and I seem to be much more alive, at home, at work. I speak more freely, I am more able to stay present when things are hard; wonderful changes! A very powerful experience and I don’t know quite what or how. – I felt re-inspired to keep leading, just being around other dance leaders and hearing their journeys. Loved hearing about Jules’ planned family day, some old ideas I’ve had for leading dance in schools came back to me. There were many other conversations and sharings i wished we could have done, for example being mentored and the journey of this relationship. I loved being with everyone, and i loved my little single room at night. – The blend of heart sharing circles and dances worked wonderfully together, making it possible to let go and be vulnerable with each other. Such a gift! Thank you all. – Once again I loved spending a weekend in such a beautiful and comfortable venue with old friends and newer ones, deepening my appreciation of this community through dancing and sharing with each other. It was great to spend time just with other Dance Leaders, sharing the joys and challenges of the role, and also learning new things from each other about aspects of the dance journey. I thought the sessions led by the Dance mentors an excellent idea, and particularly illuminating. I will definitely be going again next year! – Thanks for your hard work. I found it a very supportive experience to come. For me the dancing and sharing work so well together. I felt like you held the space beautifully as a team. Every leader present took a turn in leading a dance, a chant or a walk. The mentors who came each had a slightly longer session to share their current growing edge of deepening insight and experience, which was inspiring and illuminating for us all. Personally, I find the enormous variety of styles and approaches wonderfully rich and also encouraging. There is no need for any one of us to be anything other than ourselves. Each one brings the gift of who they are, deliciously unique and yet sharing the same underlying journey. Truly we are a model of unity in diversity. Issues that face us as leaders. What the heck are we doing? Why do we do it? What are we trying to achieve? What happens to us in the dance, our inner world. We also had some time to share and discuss around certain areas of development for DUPUK as a whole. There is need for movement forward in how we engage with dancers who are not leaders, and the discussion focussed around using the website to connect with these people. We agreed that we could encourage those who dance with us to sign up for the mailing list ‘News from DUPUK’. And we will start to send out a regular digest of longer dance events that are on the calendar using this mailing list. We have also added a Paypal button to the website to allow people to make donations easily if they feel moved to do so. We raised the idea of having a membership category for Dance Musicians, now that they can be mentored (by a Dance Mentor). This would make it possible for them to access the dance write-ups and other useful resources. Those present were in favour, so we will work on this with a view to clarifying how it can be set up so as to be voted on by the whole membership at the next opportunity. For those of you who were not present, we hope to have given you a flavour and sense of the Annual retreat. 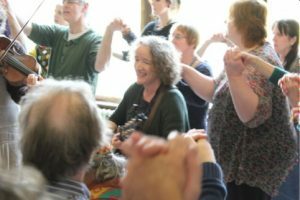 We want to include all of the supportive contact that most of us love so much: dancing, sharing, praying, eating and (some) discussion, but without too much talking! It is our chance to meet together and move forwards together, as individuals and as an organisation. And by removing the need for a business meeting (making it electronic instead) we made more time available for this. This entry was posted in For Dance Leaders, From DUP UK on 22nd February 2017 by ChrisG. 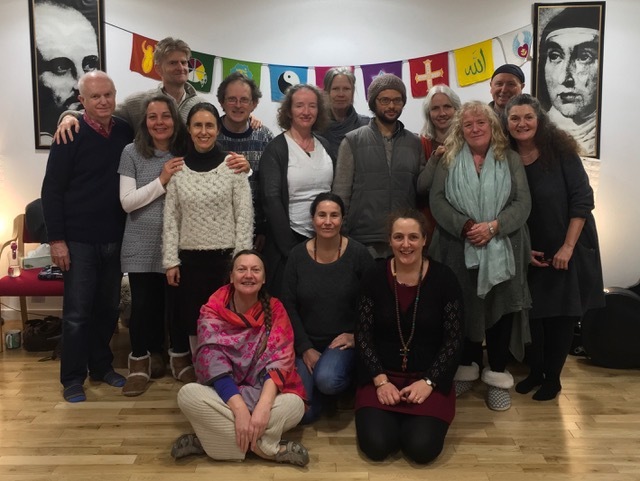 Late last year it happened that Allaudin Ottinger was in Turkey guiding a two week Sufi retreat with Mariam Baker just as we were in the process of working to secure a main guest teacher for the 2016 Dancing Spirit Camp here in the United Kingdom. It turns out that Allaudin loves to travel and as a result of a connection that was made while he was in Turkey, Allaudin is now coming to teach in the United Kingdom this year. This entry was posted in From DUP UK on 20th June 2016 by ChrisG. This entry was posted in For Dance Leaders and tagged email, Mailchimp, mailing list on 17th February 2016 by ChrisG.